Articles and blogs about the Funcube Dongle Pro/Pro+ SDR receiver, written by Alexandru Csete OZ9AEC. I just noticed today that the latest release of Qthid is available as Debian packages for Debian wheezy (testing) and sid (unstable). As a bonus it contains both Qthid 3.1 and 2.2 so you can easily upgrade the firmware of your brand new Funcube Dongle. It also contains all the necessary setup files and procedures for udev so that no manual setup is required. I tried to install the package for sid i386 on my Ubuntu 11.04 machine and it worked well. If you try them on different system that uses .deb packages, please let us know how it works. Thanks to A. Maitland Bottoms and Antoine Beaupré for packaging. I am happy to inform all users of the Funcube Dongle and GNU Radio, that the gr-fcd driver is now included in the GNU Radio source tree. You can read the announcement here. This change will be available in the next GNU Radio release, which I think will be 3.5.3, however, if you pull the code from the GNU Radio git repository the changes are already in your tree. Before you upgrade please remove any earlier installations of gr-fcd to avoid conflicting versions of the library. My repository on Github will no longer be maintained and any future development of gr-fcd will be done within the scope of the GNU Radio project. I hope this will ensure better integration, more maintainers, more testing and easier installation process. The Qthid Funcube Dongle controller version 3.1 has now been released. This release includes the necessary fixes to make qthid work on Mac OS X 10.7 Lion. Thanks to Mike KØZAP for the patch! Qthid 3.0 – the Qt-based controller application for the Funcube Dongle – has been released. 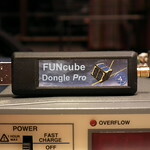 This release includes support for the full control API available with the 18f firmware for the Funcube Dongle. This should cover all the functionality provided by the “fully functional windows front-end”. Author Alexandru CsetePosted on March 11, 2011 Categories Funcube DongleTags controller, dongle, funcube, linux, mac os x, qthid, radio, receiver, SDR, software, windowsLeave a comment on Qthid 3.0 with full API support released!